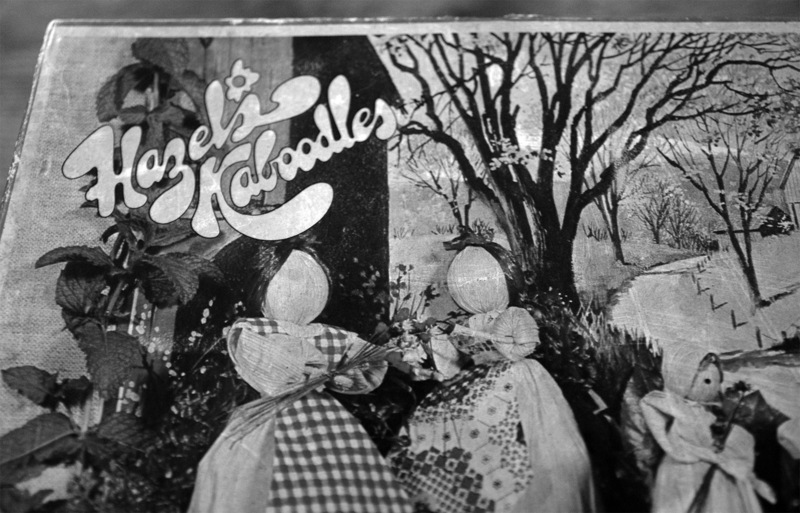 The Hazel’s Kaboodles “Corn Husk” Doll Kit. This is boxed kit that comes with all that you need to make various different sized corn husk dolls and accessories and I think it is American in origin and was made or originally released around 1976. If you should not know, corn husk dolls are, well, dolls made from the husks of corn. A connected phrase and form of traditional craft is corn dollies, although that is more often associated with the decorative, symbolic shaped harvest orientated designs that originated in pre-Christian, pagan European culture. In those times it was thought that the spirit of the corn lived amongst the crop and that the harvest made it effectively homeless. Hollow shapes were made from the last sheaf of wheat or other cereal crops and the spirit of the corn would live there until this “corn dolly” was plough into the first furrow of the new season. There a were number of traditions based around corn dollies, including one where the person who cuts the last ears of corn makes them into a doll, which is called the Corn mother or the Old Woman and is brought home on the last wagon. Or alternatively, there were beliefs that the Corn Spirit lived or was reborn in a plaited straw ornament or corn doll made from the last sheaf of corn cut, which was kept until the following spring to ensure a good harvest, with the corn dolly often having a place of honour at the harvest banquet table. However, the Kaboodle kit is for the creation of actual dolls or rather corn husk dolls, although sometimes such dolls are also referred to as corn dolls or dollies. Before the availability of the mass production of dolls for childrens and ornaments, leftover husks from corn were an accessible and I suppose probably cheap material with which to make dolls, with it thought to be a traditional form of crafting that was probably carried out in America since harvesting began around a thousand years ago. 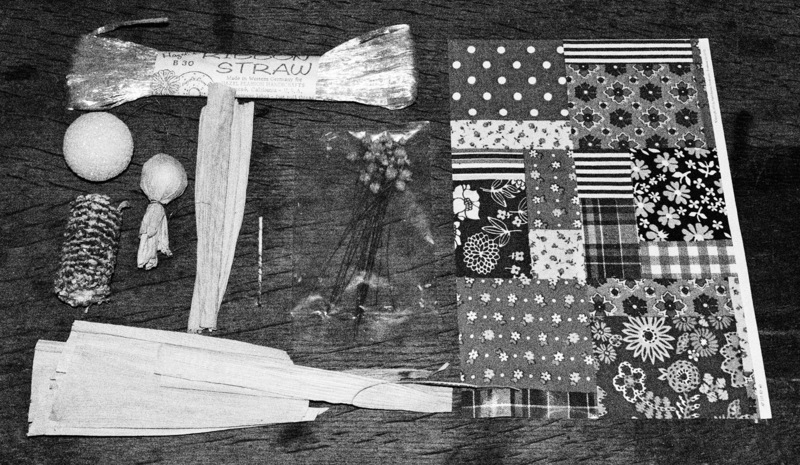 The kit is a lovely thing, designed to make 22 dolls and accessories and comes with all the required husks, twine (Hazel’s Ribbon Straw), dried flowers, balls for the dolls’ heads, paper based gingham and patchwork fabric, instructions etc. 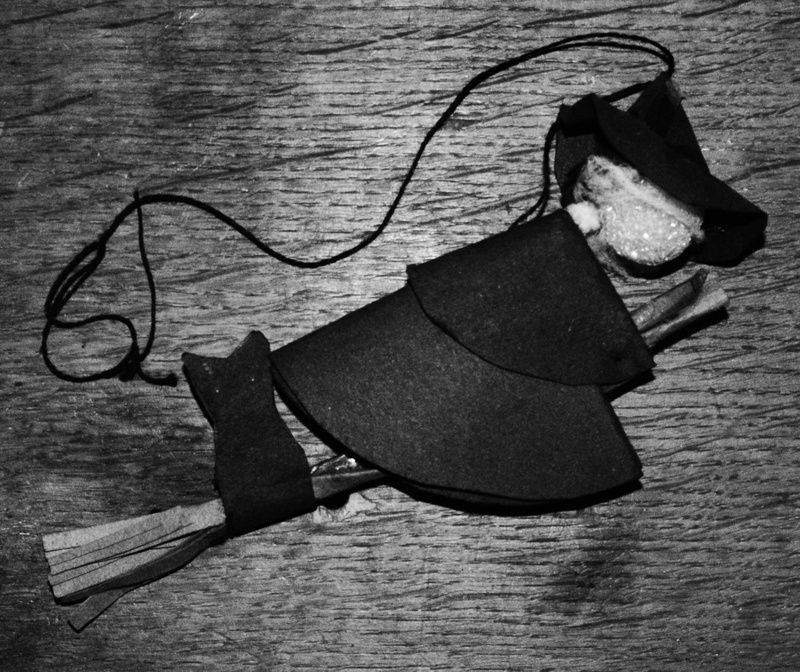 …and I particularly liked that the kit I bought came with an unexpected surprise as it contained its own little piece of repurposing from back when, as one of the doll heads had been used by a former owner to create a traditional Halloween-esque witch on broomstick hanging ornament, complete with black cat riding on the tail of the broomstick. There can be something slightly sinister or subtly unsettling at times about faceless corn dollies but generally this kit has a quite friendly, welcoming air to it. 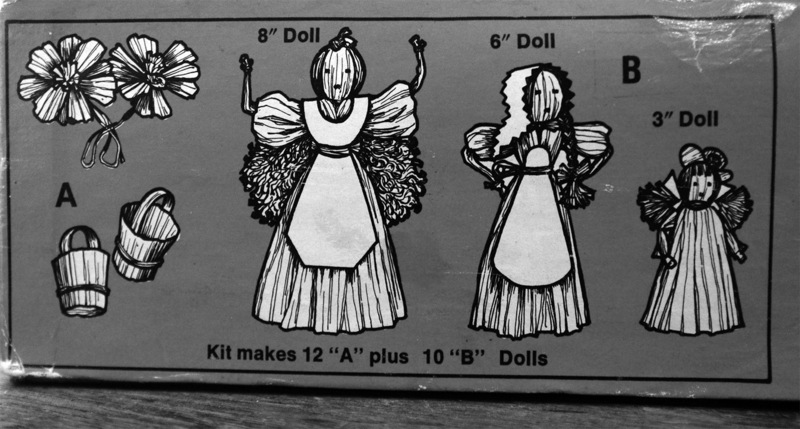 Although possibly the illustrations on the side of the box that shows how many dolls can be made from the kit wanders a bit more towards having a quietly worrying aspect or possibly even 1970s British science fiction and fantasy television scary monsters along the lines of something that had come to life in say Doctor Who or it’s like in that era. Although I expect if they had been featured in that era’s television fantasy then they may well have had featureless faces, as the more eerie creatures and characters from then seemed to, such as the one above from Sapphire & Steel. Delving further into the history of corn husk dolls, I discovered that there is a reason that they often don’t have faces or features, which can be found in a traditional Native American legend called The Story Of The Corn Husk Doll, which tells of how the Spirit of Corn, one of the Three Sisters (the sustainers of life – the three main agricultural cops of various Native American groups in North America), made a doll or dolls from corn husks. As is often the way with folkoric tales, there are a number of variations on the story and why the Spirit of Corn made the doll/s: these include because after making moccasins, salt boxes, mats etc from corn husks she wanted to make something different or because she was so thrilled at being one of the sustainers of life that she asked the Great Spirit or Creator what more she could do for the people and was told that she could make a doll from her husks that could entertain children. One of the dolls the Spirit of Corn made and which was given life to was very beautiful and when she want into the woods and saw herself in a pool she saw how beautiful she was and became very vain and badly behaved (or in different tellings she began to spend less time with children and more time merely contemplating her own loveliness or when travelling from village to village to entertain the children she was repeatedly told she was beautiful, which resulted in her becoming vain). The Great Spirit spoke to her and warned her that her vanity was not the right kind of behaviour but she ignored his warning and was given a punishment where she would have no face and not be able to converse with the birds, animals or people: she would be left to roam the earth forever, looking for something that would enable her to regain her face. Well, that started out as a cheery consideration of a 1970s corn husk doll kit and seemed to wander somewhere a little darker – and as a plot the above would not seem out of place in a more contemporary television or cinematic fantasy and indeed does not seem all that far removed from say the twists in the tales of for example The Twilight Zone, a 1970s horror/fantasy anthology film or their television series equivalent. I have wandered towards the sometimes darker, at times faceless and/or otherly folkloric intertwinings of such things before, such as the images above from a 1970s book on corn husk dolls.